Private Equity (PE) firms are usually investing in private companies or in public-to-private opportunities. PE firms are especially in cases of company succession, financial distress or growth situations suitable investors. So far, it was hardly possible to get an overview of UK’s leading private equity investors. Our top 100 list of Private Equity Funds UK changed that: we offer investment and contact details (even of the top management) of UK’s most important PE funds. The list is easily sortable and filterable. * In case of bad data availability, some values might be lacking, especially for the management contact details and AUM. You will have an immediate overview of UK’s most important Private Equity funds – without any exhausting research. 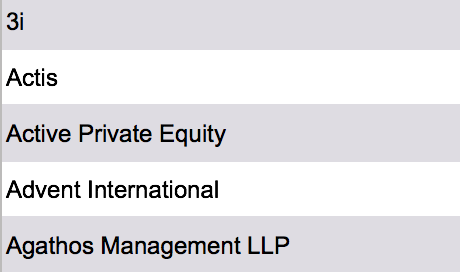 You can contact the listed PE-funds with the help of our extensive options: Mail Adress, E-Mail, Phone or Linked-In. In case of any further questions or if you want to receive a preview file of the top 10 PE-funds in UK, feel free to send us an e-mail to contact [at] researchgermany.com. We can also create custom-tailored overviews for your business needs. We are looking forward to your e-mail. 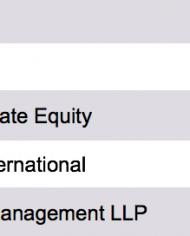 Maybe you are interested in our Top 150 Private Equity Funds Germany as well.